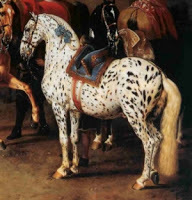 Leopard Spotted Spanish Stallions were held in high esteem for riding and high school in the early 1700s by the Imperial Riding School of Vienna (later titled the Spanish Riding School of Vienna). Details from two paintings by Johann Georg von Hamilton. 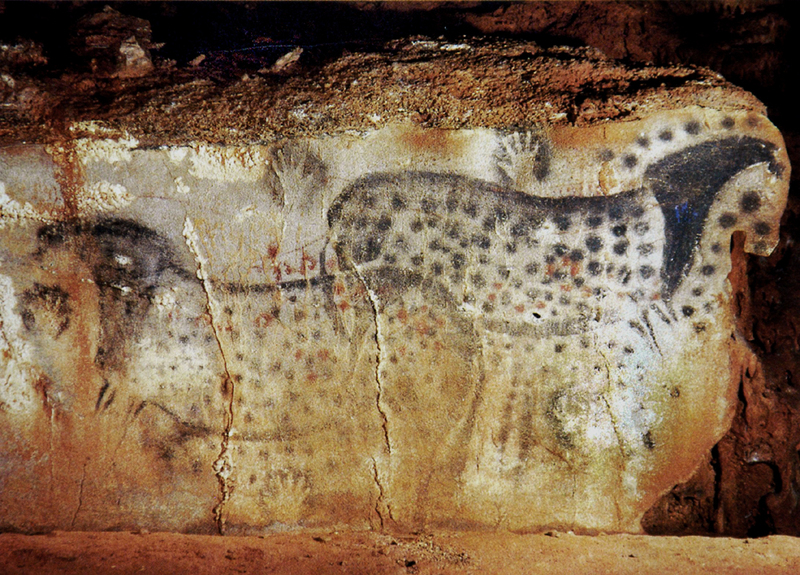 Horses with white coats scattered with slightly oval coloured spots were pictured on cave walls around Europe 25,000 years ago, particularly famous are the Peche Merle paintings in France (see photo of Peche Merle horses below); originally the spotted colouring of the horses was thought to be ‘artistic license’, no-one believed that spotted horses existed amongst the wild horses of Europe. In modern domestic horses this type of spectacular colouring is known to be caused by a partially dominant gene named Lp (short for Leopard) working with a group of Pattern modifier genes that cumulatively increase the amount of white background coat on the horse. One of these Pattern modifier genes has substantially more effect on increasing white background area and this one has been given the name Patn1; both Lp and Patn1 now have commercial DNA tests established for determining their presence. The ‘Appaloosa Project’ website https://www.appaloosaproject.co contains the most recent information and research on the leopard complex genes and is well worth visiting. Naturally, when humans started domesticating horses the eye-catching Leopard spotting coat colour was highly desired and horses with this coat colour were captured and brought into the domesticated herds. The Leopard Spotted colour pattern has had periods of great popularity, and during 17th and 18th Centuries Spanish Horses with Leopard Spots were selected as the mounts of Kings and Emperors. 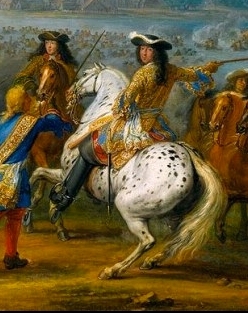 Spotted Stallions were particular favourites of King Louis XIV of France who features mounted upon Spanish Spotted horses in a number of war and battle paintings by Adam Franz van Meulen in the mid 17th Century (see below). 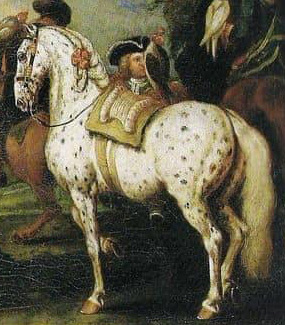 In the 17th/18th & 19th Centuries the accepted term in Britain for the PRE Horse was ‘Spanish Jennet’ and references to Jennets (also spelt genet and ginete) occur throughout written literature, documents, and artwork; the modern version of the term Spanish Jennet is Spanish Saddle Horse. 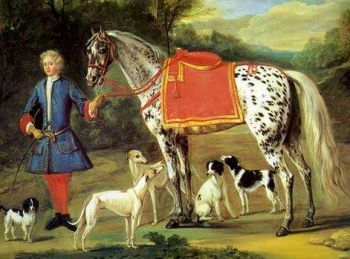 During the sixteenth, seventeenth and eighteenth centuries there were many instances of spotted Spanish Saddle Horses (Spanish Jennet horses) in England, some of which are documented in paintings, for example, pictured to the left is the painting of ‘Lady Conway’s Spanish Jennet’ by John Wootton, owned by Marquis of Hertford, and others in the art collection of the Earl of Pembroke at Wilton House. 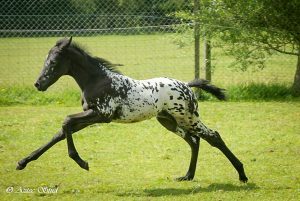 The original spotted version of the PRE horse has been extinct for several hundred years but it is now being re-created in Britain as the Spanish Spotted Saddle Horse using a blend of PRE horses combined with two Spotted breeds that descend from ancestral PRE stock, the Foundation Appaloosa descending from the PRE horses used in the conquest of the Americas, and the Knabstrupper descending from PRE horses abandoned in Denmark in 1808. The goal of the Spanish Spotted Saddle Horse breeding programme in Britain is to produce a versatile quality riding horse with the type, conformation, character, and movement of the baroque PRE with a spotted phenotype. 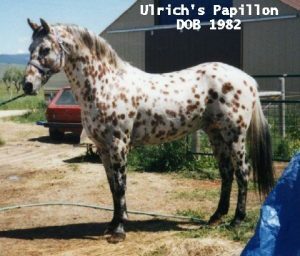 Ideally all Spanish Spotted Saddle Horses should have the Lp Spotting gene in combination with Patn1 &/or Patn2 genes to permit maximum expression of the spotted coat colour. Head – long (or medium-long) finely sculpted head with sub-convex profile from poll to upper lip. Inverted comma nostrils. Long fine mobile top-lip. Large triangular eyes. Medium size mobile ears. Neck and Body – Neck with arched crest and clean underline set high upon long sloping shoulders (45-55deg) and blending smoothly into well defined withers which should not be bulky. Broad well developed forechest. Short back, short wide strong loin fitting smoothly into a broad rounded croup, sloping pelvis (22-28deg), and a low tail-set. Frontlimbs – long sloping upper arm with elbows set under the wither. Well developed large joints. Longish cannon bones with sufficient bone for strength without coarseness. Medium length 45deg sloping pasterns. All joints aligned correctly above each other. Round medium-size hard hooves of good depth. Hindlimbs– long femur giving a slightly closed stifle-joint. Large clean hock joint with well developed long os-calcis for strong achilles tendon attachment. Medium length cannon bones with clearly defined tendons. Medium length 45deg sloping pasterns. All joints aligned correctly above each other. Round medium-size hard hooves of good depth. Movement – powerful over-tracking walk, trot, and canter with distinct flexion of all joints and good elevation front and hind. The tail should be carried quietly and low when moving. Naturally balanced with the weight on the rear quarters giving a highly mobile and responsive riding horse with excellent ability for jumping and dressage. Colour -Any base coat colour or diluted base coat colour is accepted. Minimal or no white markings are preferred in order to make the most of the Lp phenotype. Horses with the Grey gene are not admitted to the Main Studbook and are registered in the Section 2 Appendix. Heterozygous Grey mares must be bred to non-grey PRE stallions and any progeny with Lp but without the Grey gene will be entered into the Main Studbook. Grey colts should be castrated and produced for riding and sport. Class 2 to Class 5 Spanish Spotted Saddle Horses may show some deviation away from the above Breed Standard as the % of PRE blood decreases. 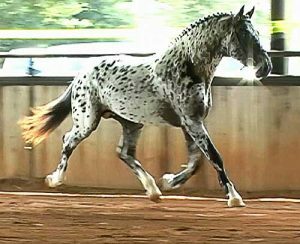 The Spanish Spotted Saddle Horse is a Purebred based upon the foundation of Approved for Breeding PRE Horses or PRE Fusion Horses (minimum 50% PRE) combined with Foundation-bred Appaloosas and Classic Knabstrupper Horses. The Main Studbook consists of 5 Classes which reflect the increasing percentage of PRE blood to the desired goal of over 90% PRE ancestry. Class 5 horses are a minimum 25% PRE blood and have the Lp gene. Class 2 Horses are 87.5% PRE blood with the Lp gene. Class 1 Horses are 93.75% or more PRE blood combined with the Lp gene. The expectation of the Breeding Program is for each Class of SSSH to be bred to a PRE Mare or PRE Stallion, or to a Spanish Spotted Saddle Horse of a higher Class (more PRE blood) and for the progeny to move up to a higher % Class with each generation. 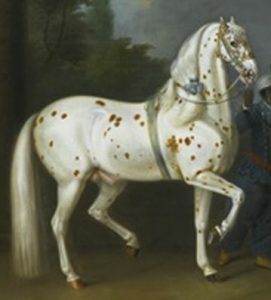 However, breeders may continue to introduce new blood into their breeding program via first cross products between the above 3 breeds but they should bear in mind that the desired goal of the Studbook Breeding Program is to firmly establish and maintain the Spanish Spotted Saddle Horse at 90% PRE blood or higher in combination with Lp and Patn genes so that the baroque PRE phenotype with a spotted coat is fixed, returning a re-creation of the historic spotted Spanish Jennet to the world. Right: Aztecs Ozomatli. SSSH Class 4 colt with 50% PRE blood. c) the Foal is confirmed to have the Lp gene either as a result of a clearly visible spotting pattern at birth, or by genetic test for the Lp gene if the birth coat looks solid coloured. d) the Foal does NOT have a Grey gene. If neither parent has a Grey gene then the foal cannot have a Grey gene so there is no need to test for Grey. If one parent has a Grey gene the foal must be genetically tested for the presence of Grey gene. The requirement to test is caused by the variability in expression of the Grey gene, sometimes the grey gene is easy to detect visually, but in other foals it can express late and the horse appears non-greying for several years. e) the Foal does not have PSSM gene. If the Appaloosa lineage parent/s is/are certified PSSM negative then the foal does not need to be tested for PSSM. See ‘FOAL REGISTRATION PROCEDURE‘ lower down the page for forms and details. Equines of another Purebred breed cannot be admitted directly into the Spanish Spotted Saddle Horse Studbook, but breeders may continue to introduce new blood into their breeding program via first cross products between Approved for Breeding PRE horses and Foundation-bred Appaloosas or Classic Knabstrupper horses. SSSH Class 5 Mare (25% PRE) Aztecs Shoshana..
Photo by Karen Collison (Breeder). 5a. Incorrect procedures with Covering Certificate or Foal is not at foot with dam, but Foal has No DNA Type and parentage test. 5b. Genetic Tests for inheritable defects are not completed. 1) The PRE parent or Grandparent lacking Breeding Approval, is Approved for Breeding by the ANCCE-LGPRE. 2) The Spanish Spotted Saddle Horse Sire is Approved for Breeding. 4) The Genetic Tests for inheritable defects are completed and are Negative. 5) Foals without a Grey gene born from a Spanish Spotted Saddle Mare with one Grey gene, providing the product has the Lp gene, will be upgraded to the Main Studbook. 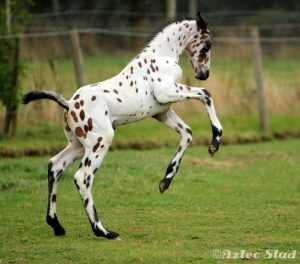 6) Foals with the Lp gene born from a Spanish Spotted Saddle Mare without the Lp gene, will be upgraded to the Main Studbook. 7) Horses with Lp gene which are 75% PRE blood born to Spanish Spotted Saddle Mares derived from British Spotted Pony bloodlines can be presented for Assessment at 3yrs old or above. If the horse averages 5/10 or above the horse will be upgraded to the Main Studbook as an Approved Breeding horse (Mare or Stallion). ALL Changes MUST be Registered with BAPSH Ltd within 30 DAYS of the Date of Change. Spanish Spotted Saddle Stallions must be registered with BAPSH Ltd in the Main Studbook, DNA typed and Parentage confirmed. Stallions will have been PSSM tested negative as a foal or will be born from PSSM negative Appaloosa lineage. The Stallion must be over 3 yrs old and have been assessed by the Breeding Evaluation Team and awarded 5/10 or higher (see paragraph on Breeding Evaluation below for details). Spanish Spotted Saddle Mares may also be presented for assessment in the same manner as the Stallions; breeders/owners are recommended to undertake the assessment which provides valuable information for the breed and breeding programmes. At present there is no barr upon breeding from Spanish Spotted Saddle Mares which have not been assessed. All PRE sires or dams must be Approved for Breeding at the Basic level by the ANCCE-LGPRE. Appaloosa Mares or Stallions should be of Foundation Type, over 3 yrs old, and be correctly registered with the appropriate Studbook with a full pedigree. Knabstrupper Mares or Stallions must be over 3 yrs old and registered in the Knabstrupper Classic Horse Studbook with an approved pedigree. 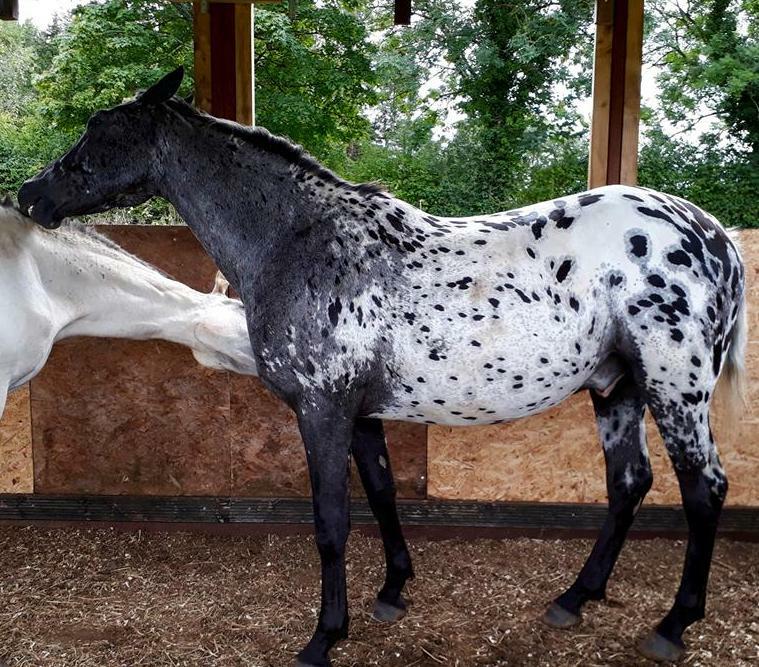 Below – Left: Ulrich’s Papillon – Foundation-bred Appaloosa Stallion, USA, who has Appaloosa descendants in the UK. Right: Helios of Independence, young Classic Knabstrupper Stallion, owned by Penny Rivers. Here he is undergoing his Breed inspection in the USA. Embryo Transfer is permitted using any healthy Mare of good size as the host/s but it is recommended to use PRE or Appaloosa mares for transmission of good temperament to the foals. 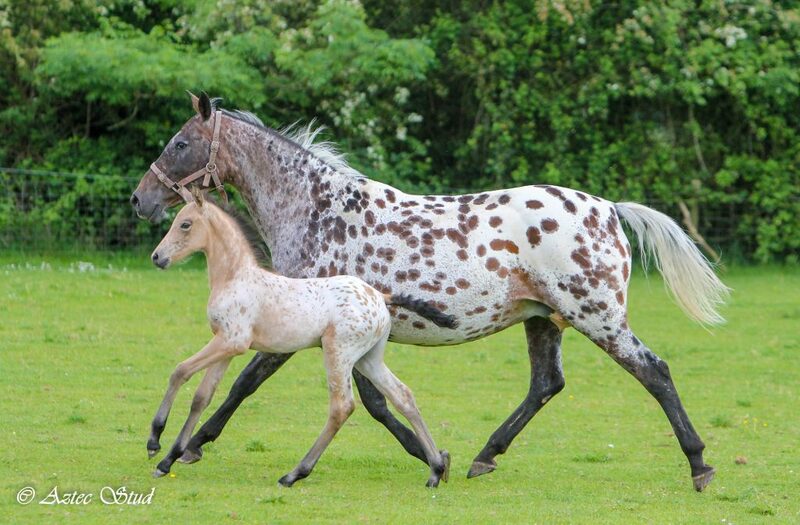 Spanish Spotted Saddle Mares may have more than one foal registered from them each year via the use of host mares. All Mares must be over 3 yrs old before being put in foal. Covering Certificates for PRE Stallions and SSSH Stallions can be obtained from the BAPSH Registry Office. Appaloosa and Knabstrupper Stallion Covering Certificates must be obtained from the relevant Studbook with which that stallion is registered. Breeder/Owner downloads the BAPSH Ltd Register II Section 2 Foal Registration Application Form or requests a copy from the BAPSH Ltd Registry Office. The Foal Registration form and DNA sample are sent to BAPSH Ltd with copies of the Parents Registration documents with 4 generation pedigree, Genetic Health Test Results (if available) for Appaloosa or SSSH parent, & copies of parents’ passports, and the Mare Owner’s Section of the Covering Certificate, plus the appropriate fee to include the fees for the following DNA tests where required. b) If the PRE parent is Grey then the foal must be tested for the Grey gene. Foals with non-Grey parents do not need this test because Grey is a Dominant gene and will always be expressed in the coat colour of the parent. c) If the Covering Certificate and Registration application time-frames were not adhered to the Foal must be DNA Typed and parentage tested. d) The test for PSSM is done if the Appaloosa lineage parent or parents is/are NOT certified Negative for this genetic disease. Hair samples that are not used are stored securely in that horse’s own dossier. When BAPSH receives the required certificates from Animal Genetics, the Foal Registration is completed, the UELN allocated and the Passport printed. Stallions – Breeding Evaluation is compulsory for Stallions over 3yrs old registered in the Spanish Spotted Saddle Horse Main Studbook before they may be used to cover mares. iv) Movement and athleticism for Riding and Sport. 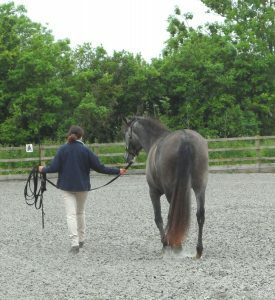 Walk is assessed in-hand, and trot and canter are assessed in Freedom; then the horse is assessed loose over a series of jumps down a short jumping lane..
Below, the same PRE mare is ‘Walking out In-hand’ in a good active manner for the Movement assessment. Horses (mares, stallions, and geldings) that compete in Dressage, Show Jumping, Eventing, Driving, and Endurance at the higher Affiliated levels can gain points for achieving specific scores or %. The number of points required to achieve the ‘Sport’ designation is dependent upon the Sport; points must be achieved across a minimum of 5 shows/competitions in a particular sport over a 12 month period. The Owner of the horse must submit documentation to the BAPSH at the end of the 12 month period to prove the achievements. The horse is then awarded the title of Sport-Drs, Sport-SJ, Sport-Ev, Sport-En, or Sport-Drv, or any combination of these titles. This information is added to the horse’s online web information and pedigree which should be live online by early March 2019. 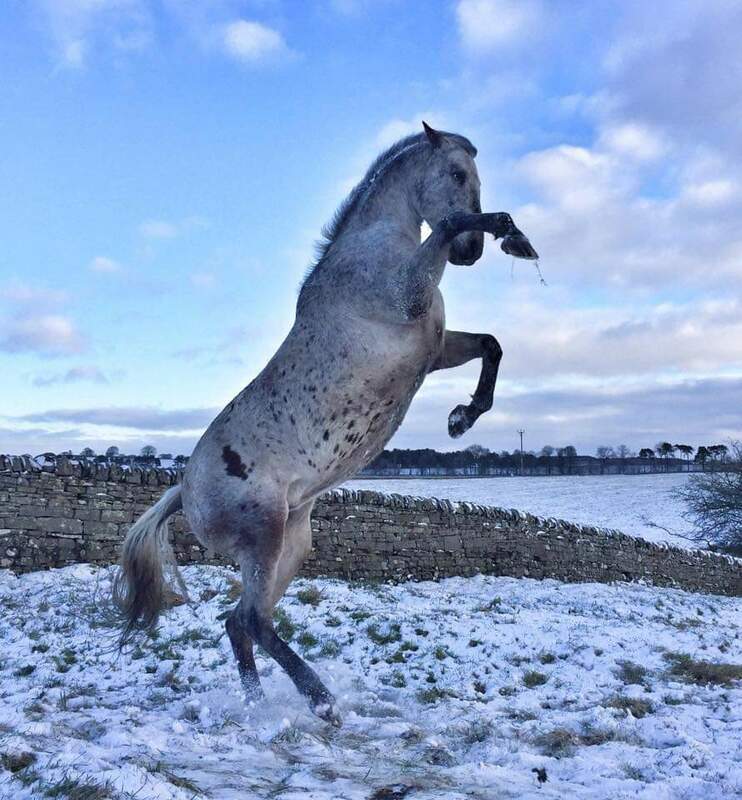 Above: Aztecs Acuarela – Class 5 SSSH mare (25% PRE) jumping for joy in the snow . 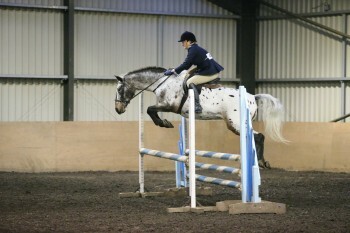 Owned by Caroline Howlett, bred by Karen Collison.